Tile floor medallions are a classic symbol of luxury and sophistication, but these days, it's easier than ever to install one. HomeThangs.com has introduced a simple guide to getting this great look - without the help of a professional. Floor medallions are easier than ever to install. 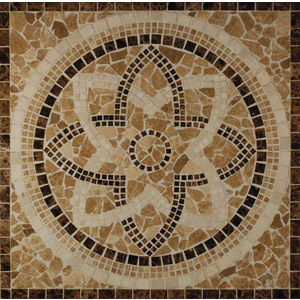 Rather than needing each mosaic piece to be cut, arranged, and installed by hand, newer medallions are available in DIY-friendly mosaic tile sheets. HomeThangs.com – the Online Home Improvement Store has made their goal to deliver the right product to the consumer. With that in mind, shopping and home design tips, as well as special product selections are being introduced. 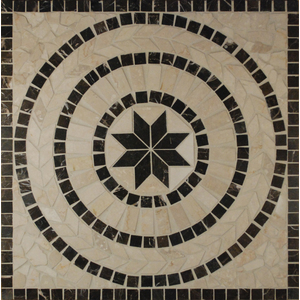 Floor medallions are often found in entryways or other large, open spaces – places where they’re free to make an impression. They can be made of stone or other tile or sometimes wood pieces, and can either be assembled or carved, etched, or stained directly onto the floor. They’re usually circular in design and act as a centerpiece in a room. But while they’re most often found in public areas of the home, HomeThangs.com has introduced a guide to using them in other parts of the home as well – particularly the bathroom. 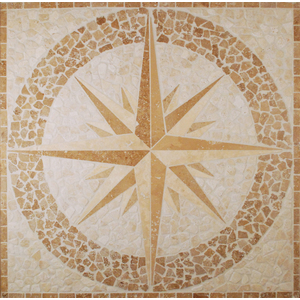 It’s maybe no surprise that floor medallions have found new life in luxury master bathrooms. After all, high end bathroom design has catapulted to the top of most homeowner’s must-have and to-do lists, and as in entryways, there’s nothing in the middle of a large bathroom floor to cover up a beautiful medallion. Paired with a matching marble floor, even a small or simple floor medallion creates a gorgeous, classical look that lends immediate sophistication and elegance to a traditional bathroom design. These floor medallions are also easier than ever to install. 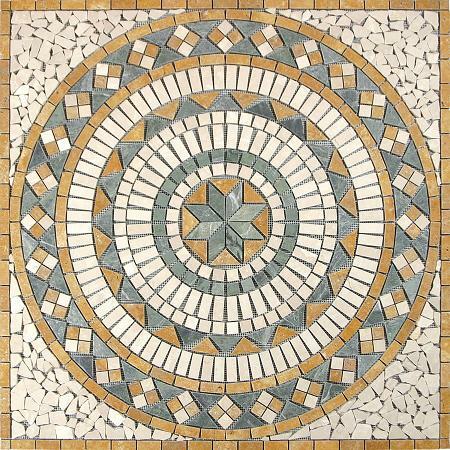 Rather than needing each mosaic piece to be cut, arranged, and painstakingly installed by hand, newer medallions are available with one simple but all-important twist: many are now sold as mosaic tile sheets. Most tile sheets are made of a single type of tile arranged in a repeating pattern and affixed to a mesh backing that allows them to be installed all at once. Modern floor medallions mimic this idea on a larger scale, affixing a complete medallion to a massive mesh sheet so the whole thing can be installed seamlessly and in a single piece. 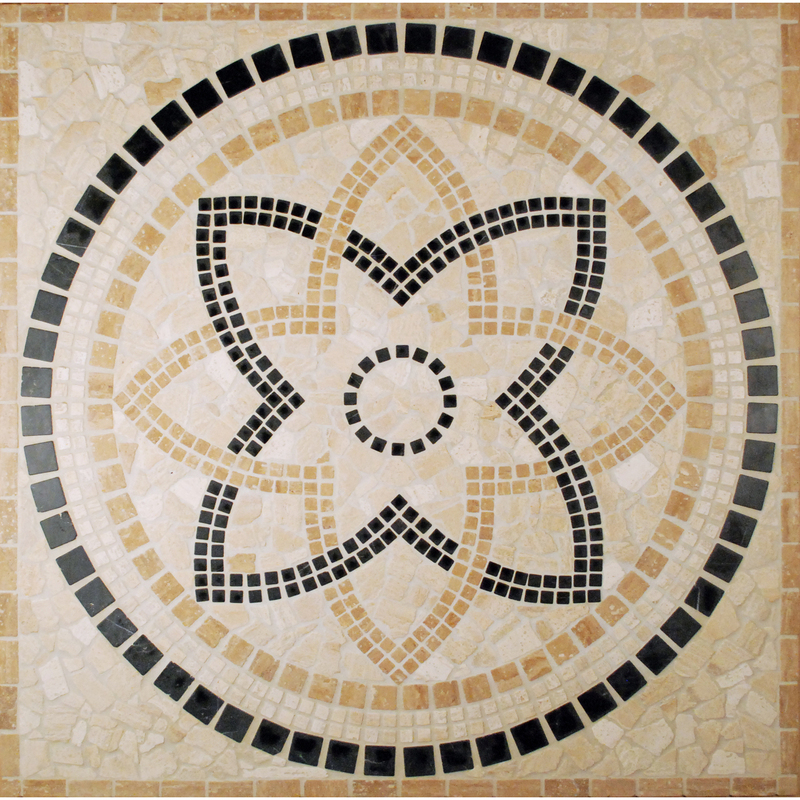 Practically speaking, this means that a floor medallion can be installed almost as easily as any other piece of tile flooring, and with no more trouble than a mosaic tile backsplash. 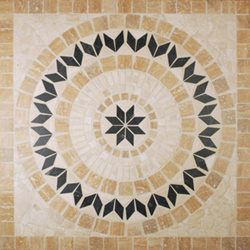 In fact, because most sheet-style floor medallions are designed with a built-in border around the outside edge, it isn’t even necessary to precisely match them with the surrounding stone flooring, either. As long as at least one of the colors is close, and the overall color scheme has the same base tones, the same pre-made medallion will match with a variety of stones. The most obvious application for floor medallions in the bathroom is to put them in the middle of the bathroom floor, but the placement doesn’t necessarily have to be in the dead center of the room. In fact, medallions can be used quite nicely to highlight other features – especially large, freestanding soaking tubs – or offset one part of the bathroom from another by indicating and encompassing the area immediately around them. Floor medallions aren’t just for use in the main bathroom, either. They can also make a stunning accent in a luxury shower floor. Because medallions are circular in shape, it’s often quite easy to remove the very center of the design and use the surrounding pattern to disguise the shower drain. Coincidentally, many of these floor medallions come in the same standard square size as smaller manufactured shower enclosures, meaning they can be used to entirely replace a generic, much less attractive shower pan. Just be aware of the materials used in the mosaic sheet to ensure they can hold up to the moisture conditions in the shower. Finally, floor medallions don’t necessarily have to be installed on the floor. Because they’re every bit as flexible as mosaic tile sheets, they can just as easily be installed on a wall. These medallions make a lovely backdrop for a luxury clawfoot or other freestanding tub, and also work quite well as an inset for a shower. These applications can be somewhat more visible than a floor installation, and work especially well to highlight a niche area, or to really bring a dramatic focal point to the fore. To see some of these ideas in action, read the full article here, or check out more floor medallions from Tesoro. HomeThangs.com is not only a home improvement superstore, it also provides expert design tips and a comprehensive shopping guide, taking the ideas from professional interior designers, and offering tips to the consumers on how to pick the products to best suit their needs.